Cascade Locks is a city in Hood River County, Oregon, United States. The city took its name from a set of locks built to improve navigation past the Cascades Rapids of the Columbia River. The U.S. federal government approved the plan for the locks in 1875, construction began in 1878, and the locks were completed on November 5, 1896. 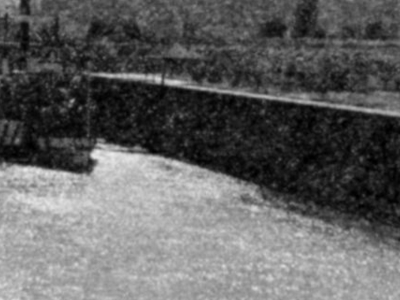 The locks were subsequently submerged in 1938, replaced by Bonneville Lock and Dam, although the city lost no land from the expansion of Lake Bonneville behind the dam located some four miles (6 km) downstream of the city. 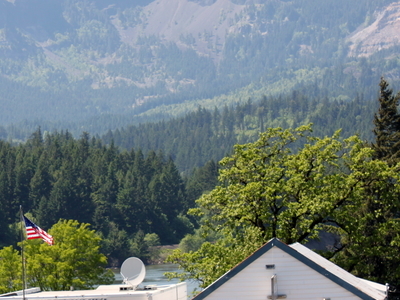 Post office in Cascade Locks, Oregon with the Columbia River in the background. Cascade Locks is located just upstream from the Bridge of the Gods, a toll bridge that spans the Columbia River. It is the only bridge across the Columbia between Portland and Hood River. Cascade Locks is also a few miles upstream of Eagle Creek Gorge, a popular scenic area that doubles as an alternate route for the Pacific Crest Trail. Cascade Locks is used frequently by hikers along the Pacific Crest Trail (PCT) to cross the Columbia River. Cascade Locks is the lowest point along the trail, which runs from the Mexican border in California to the Canadian border in Washington. Here's the our members favorite photos of "Cities in Oregon". Upload your photo of Cascade Locks!